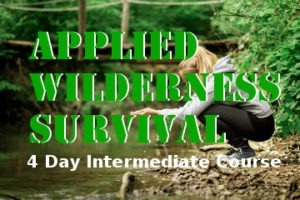 Applied Wilderness Survival – Trail Blazer Survival School, Inc. The 4 day Applied Wilderness Survival Course is designed to teach you the skills necessary to survive any situation with confidence. The training includes; shelter building, water procurement, fire making, food procurement, tools and cordage, and more. Learn essential life saving skills that could be used in any situation. Set up your tent and spend the night, fish from our lake after each class, hike our beautiful trails, and relax at our central camp fire. If classes aren’t being taught in our demonstration shelters you are welcome to use them and try your skills at spending a night in a primitive shelter. This is our most popular course, and we look forward to having a full class. You will want to reserve your spot quickly. These will be a mix of lecture and practical hands on learning. You will be busy the entire 40 hour week. Unlike other survival schools you may have gone too, if we don't cover the material you will be given a voucher to come back free at your convenience to any of our single day classes to receive the missed information. For this reason we have a no nonsense philosophy in our classes to insure all material is covered to our exacting standards. We also guarantee that if you feel that we didn't cover a subject adequately you can also receive a free voucher to a single day class that covers the subject. What to Bring?